I have made an African flower motif chicken doorstop for the chicken challenge with my spinning group. All the wool is my own spun wool. I have Navajo plied the red and the fawn ram's wool. The rest is dark brown alpaca plied with FinnX some light ram's wool and some dark ram's wool plied with cotton. I have given the instructions for the African flower motif in an earlier post. The top tails feathers are core spun wool edged with ram's wool and dark FinnX plied with dark alpaca. The bottom tail feathers are dark rams wool edged with dark Finn cross. I didn't have a pattern. I saw a picture of a crochet chicken and have adapted that. I have really enjoyed making it and it has a really good challenge. I wet felting 3 eggs to go with my chicken and am using left over bits of wool and letting my washing machine do most of the work. I tidy up the eggs by needle felting them. There are some really great African flower animals on Renate Gerhardt's Pinterest board. They really do look impressive. 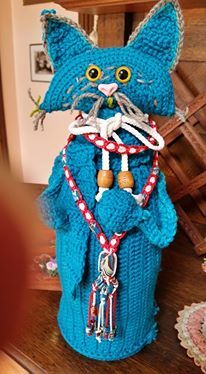 Great way to use of scrap yarn. Great asset to your battery of skills and things to make to embellish whatever you are making. These poinsettias are easy but very effective. 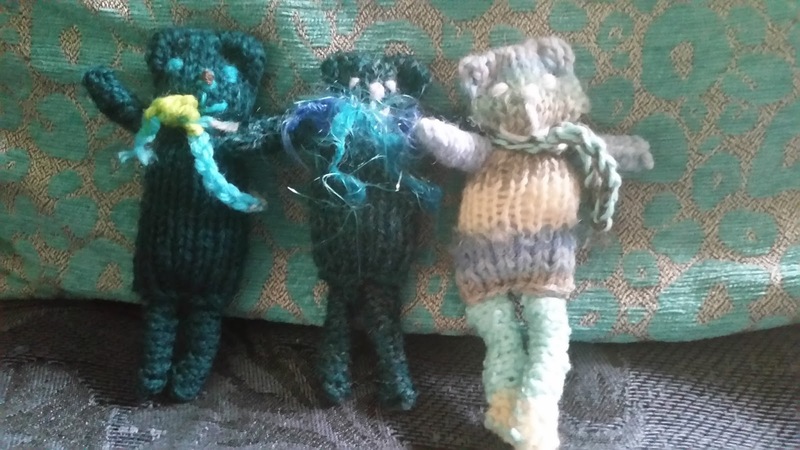 I made these teddies to donate to a buddy bear programme. I made some last year which were a bit bigger. These are about 11cm tall and can easily fit in a pocket. They are quick and easy to make and a bit addictive. I'd like to be able to improve the features. It doesn't matter if I sew them after or before. They are not quite what I want. 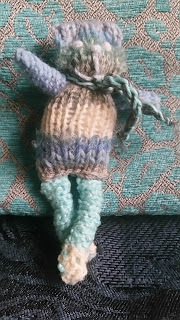 I have been using up my odd bits of wool to make these so it's been pretty handy like that. Knit 22-26 rows depending on how long you want the body. For the arms and legs roll the pieces and stitch. On the arms leave a long thread at one end. Sew the body seam which is then in the middle at the back. Make a hole with pencil or scissors where arms will go. Thread the arm piece through the the body by pulling on the thread with a thick sewing and easing it through. Sew the legs in place and close all seams at the bottom of the bear. This video shows some nice baby pants to knit for a toddler. Our winter is in June so my baby pants are ready for my little grandson to be one. Luckily Instagram and my daughter like them. They took a while to knit because they were on 2.75 and 3.25 needles and I made them with Patons Bluebell . The video baby pants will be a bit quicker and, as always, once you have mastered the pattern you can change it to your own ideas and colours. I have been knitting baby pants for my little grandson for winter this year. He had some lovely blue and white striped pants as a new born and , of course, he has grown out of them. I am using 4 ply wool and 2.75 and 3.25 needles so they are taking a while. The pattern is not the same as the one I am sharing now but so similar. These monster pants are so cute. Mine have a turnover band at the top with thick elastic threaded through. The pattern I have had them knitted in garter stitch which would be a different look and produce thicker pants. Once you have a basic pattern you can do whatever you like! The baa-ble hat was the free pattern for Shetland Wool Week 2015. it's is so cute and the Shetland colours make it. You could use other colours, though You can get the free pattern here. If you are interested in the 2017 Sheep Wool Week beanie then you can find the pattern on the Shetland Wool Week site. These Christmas characters are so cute. It might be a bit late to do them now for Christmas. depends what other things you need to do! These would make lovely gifts and super cute decorations. I love him. So colourful.